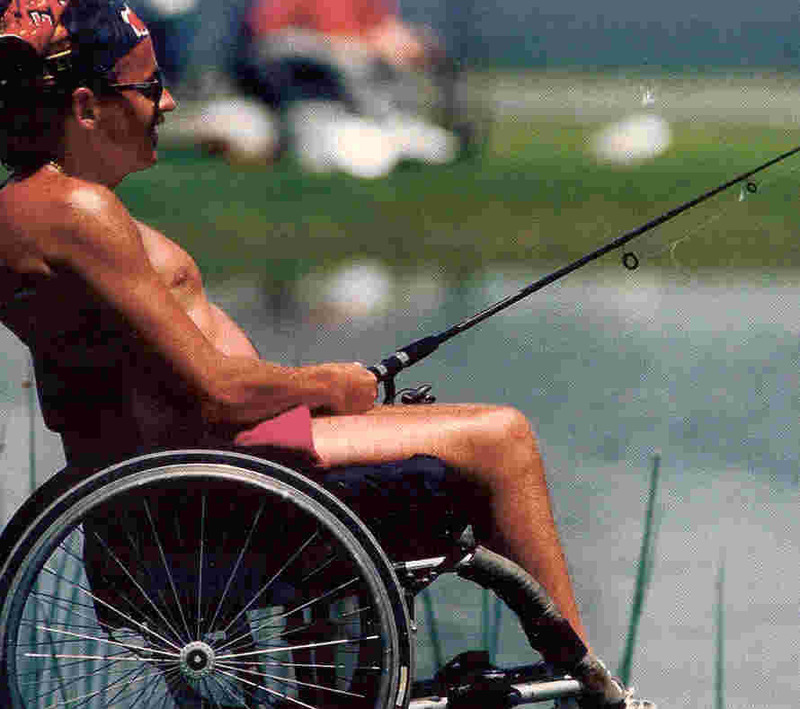 Over the years, I have noticed many friends and colleagues with physical disabilities basking in the sun’s warmth, an activity they can partake in as readily as any able-bodied individual. With moderation, they should keep on basking; it’s healthy. Although dermatologists advocate avoiding sunlight to prevent skin damage, a growing body of science suggests that the sun exerts many healing benefits. In fact, epidemiological studies indicate that you are much more likely to die from disorders aggravated by chronic underexposure to the sun than disorders aggravated by overexposure. In just one of many examples, epidemiologists estimate at least 55 men die prematurely from prostate cancer from too little sun for every man that dies from too much sun. This article’s purpose is to describe some of the sun’s healing benefits, especially for spinal cord injury (SCI) and multiple sclerosis (MS) and how they are mediated through vitamin-D metabolism. Throughout history, many healing modalities have cycled in and out of favor. Sunlight (heliotherapy) was often a part of mankind’s healing armamentaria, including that of Hippocrates, the Father of Western Medicine. In the early twentieth century, heliotherapy was used to treat many disorders, such as tuberculosis, rickets in children, and war wounds. Its importance was underscored when Dr. Niels Finsen was awarded the 1903 Nobel Prize for developing an ultraviolet (UV) treatment for tuberculosis. Boston’s Floating Hospital got its name because it originally was located on a floating boat, in which children with rickets could sunbathe. At that time, many hospitals were built to allow access to more sunlight. Sunlight remains an important hospital-design consideration as documented by a recent study showing that spinal-surgery patients assigned to bright, sunny rooms needed much less pain medication. However, as our increasingly pharmaceutically oriented medical profession developed powerful, infection-fighting antibiotics and drugs, and as milk and other foods were supplemented with vitamin-D, heliotherapy faded to the background. Its decline was greatly accelerated by the fear of acquiring skin cancer. In my lifetime, I’ve seen a great shift on this issue. For example, when I was a child, my mother told me to play outside and get some sun. In contrast, today’s mothers lather sunscreen on their children, which, in spite of good intentions, evidence suggests may promote a vitamin-D deficiency that may have life-long implications. Heliotherapy is once again emerging from the dark; there is simply too much evidence supporting its use to ignore. Sunlight is composed of electromagnetic radiation of varying wavelengths, ranging from the long-wavelength infrared light to the short-wavelength ultraviolet. The ultraviolet light is further subdivided into UVA and the even shorter-wavelength UVB radiation. Although UVB causes sunburns, it is also the component that initiates Vitamin-D production in the skin. Exposure to vitamin-D-producing UVB light can vary greatly depending upon many factors, including time of day and year; and the latitude, altitude, and prevailing weather conditions of where we live. Latitude is especially important. For example, if you live north of about 37o (roughly, a line from Richmond to San Francisco), you will be exposed to little UVB from at least November through February because the sun’s zenith angle is so low that the atmosphere absorbs most UVB before it reaches you. Because it is fat soluble, excess, sun-produced, vitamin D is stored in body fat, and, to some degree, can be later used in sun-deficient periods. The process by which vitamin D is produced and exerts its biological effects is complicated, involving several vitamin-D-related molecules (see illustration). Basically, UVB light triggers a modification of a cholesterol-related molecule located in the membrane of skin cells. The vitamin D that is created is then ejected from the membrane into our circulation system, where it travels to the liver. In this organ, it is transformed into 25-hydroxyvitamin D, the derivative that doctors use to assess overall vitamin-D status. The kidney, as well as some other tissues, further converts this precursor into 1,25-hydroxyvitamin D, the most physiological active vitamin-D metabolite, which is also called calcitrol. Traditionally, calcitrol is understood as a hormone that, together with parathyroid hormone, regulates blood calcium levels and, in turn, bone density. In this role, calcitrol targets the intestine, where it promotes calcium absorption; and bone, where it catalyzes calcium release to help restore depleted blood calcium levels. However, recent studies indicate that viewing calcitrol just in this role is quite limited. In fact, the hormone exerts a plethora of biological effects on diverse tissues, implying that this sunlight-generated hormone sustains health throughout the body. Although much remains to be understood, basically, circulating calcitrol enters cells and complexes with the genes in the cell nucleus. This affects DNA expression and, in turn, overall cell functioning and growth. Because calcitrol maintains normal cell proliferation, it inhibits cancerous growth. In addition, calcitrol influences immune-cell activity, helping to explain vitamin D’s seemingly beneficial role in infectious disease and immune-related disorders, such as multiple sclerosis, rheumatoid arthritis, and diabetes. Given these considerations, the implications of preventing vitamin-D deficiency, either through sunlight or diet, are now more profound than ever. Relatively few foods naturally contain vitamin D, the most abundant being oily fish like salmon, sardines, and mackerel, or old-fashioned, cod liver oil. Because of limited natural sources, numerous foods, such as milk, are vitamin-D fortified. Many scientists now believe we need 1,000 IU per day of vitamin D (IU = international units, a measure of vitamin potency) to avoid deficiency. For reference, a salmon serving contains about 360 IU, a glass of fortified milk about 100 IU, an egg 25 IU, and a tablespoon of cod liver oil 1300+ IU. In comparison, full-body sunbathing for a period of time that will just make you turn pink will produce 10,000-20,000 IU of vitamin D, equivalent to 100 to 200 glasses of fortified milk. Given such copious production, relatively casual sun exposure (arms, etc) should meet vitamin-D needs. Remember, however, that no vitamin D will be generated in short-daylight months above certain latitudes. In these periods to avoid vitamin-D deficiency - especially if you don’t like oily fish or are lactose intolerant - you will need to consume a supplement or use a UVB-emitting tanning bed. Studies have shown that individuals who use such a tanning bed in winter have serum levels of 25-hydroxyvitamin D (the marker for vitamin-D status) that is 90% higher than controls. The importance of solar-produced vitamin D was underscored in a study that evaluated vitamin-D status in a submarine crew after two months of acute sun deprivation. Although the crew consumed a vitamin-D fortified diet, their levels of this nutrient plummeted. Vitamin D can be toxic if too much is consumed from supplements or mistakenly over-fortified foods. However, prolonged sun exposure does not generate toxic vitamin-D levels due to the body’s feedback regulatory mechanisms. Although everyone is vulnerable to vitamin-D deficiency, especially in winter, certain groups are particularly predisposed. First, when exposed to the same amount of sunlight, elderly individuals produce only 20% of the vitamin-D young adults do. As a result, more than half of individuals older than 65 are vitamin-D deficient. Second, due to their skin pigmentation, African Americans require much more sun to produce the same levels of vitamin D than do fair-skinned Caucasians. At least 50% of African Americans, who are also less likely to drink fortified milk due to lactose intolerance, are vitamin-D deficient sometime during the year. Apparently, as a consequence, they have a much greater incidence of disorders associated with reduced sun exposure of northern latitudes. Finally, people with spinal cord injury and multiple sclerosis often have decreased vitamin-D levels. As summarized in two key articles, research carried out by Dr. William Bauman and colleagues, Bronx VA Medical Center indicates that individuals with SCI are often vitamin-D deficient (see Metabolism 44(12), 1995; & J Spinal Cord Med 28, 2005). Like astronauts who lose bone density from the lack of weight-bearing activities, paralysis causes osteoporosis. As much as 50% of lower-extremity bone mass is lost during the first several years after injury, people with complete injuries losing the most. Hence, a deficiency in bone-enhancing vitamin D further aggravates an already serious SCI problem, in turn increasing fracture risk. 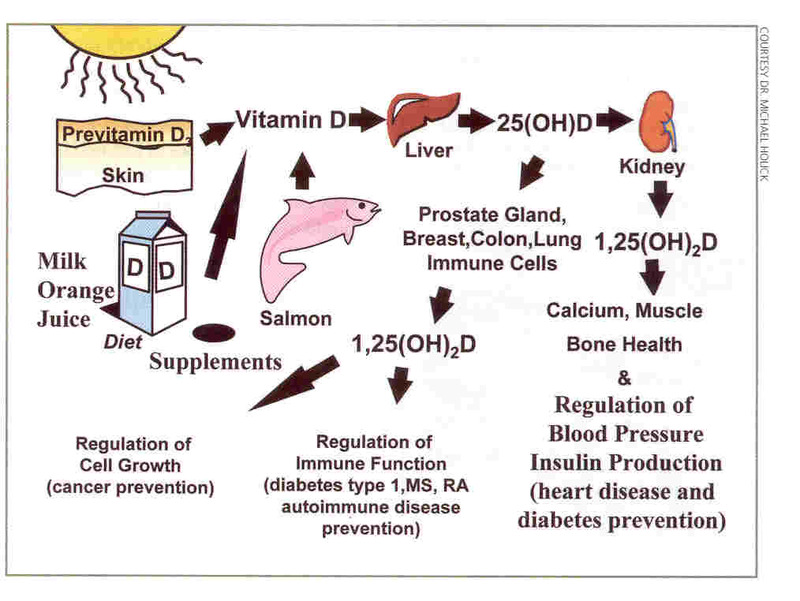 Bauman believes SCI predisposes one to vitamin-D deficiency for several reasons. For example, he speculates that due to limited mobility, someone with SCI may not get as much vitamin-D-producing sunlight as the general population. Supporting this idea, other scientists have demonstrated that pressure-sore-afflicted patients with SCI, who have access to the least sunlight, have the greatest vitamin-D deficiency. Bauman also suggests that a lack maybe be caused when health-care professionals recommend reduced consumption of vitamin-D-fortified dairy products under the mistaken belief that the calcium in such foods will aggravate kidney problems. And, he believes that many SCI-associated medicines reduce the body’s vitamin-D stores. In his 1995 study, Bauman compared vitamin-D levels in control subjects and in 100 veterans with SCI who averaged 20 years post-injury. Subjects with SCI were twice as likely to have vitamin-D levels less than that considered normal (again, the marker for vitamin-D status in the body is 25-hydroxyvitamin D produced by the liver). In his 2005 study, Bauman examined the effectiveness of several dosing regimens in elevating vitamin-D levels in people with chronic SCI. In one regimen, 40 subjects consumed 800 IU of vitamin-D per day for 12 months. Their mean age was 43; injury duration averaged 12 years; and 17 and 23 had quadriplegia and paraplegia, respectively. Before supplementation, 33 had below-normal vitamin-D levels; in contrast, after 12 months of supplementation, only 9 remained deficient. Although average serum vitamin-D levels doubled in subjects, Bauman believes that even greater supplementation is needed to obtain nutrient serum levels needed for promoting optimal bone health in SCI. MS is influenced by multiple interacting genetic, environmental, nutritional, hormonal, immunological, and viral factors. It is strongly correlated with sunlight, which is a function of latitude, season, prevailing weather, etc. As summarized in UV Advantage by Dr. Michael Holick (2003), MS incidence is five times greater in North America and Europe than the tropics. In the southern US, MS prevalence is about half that of the northern part of the country. In one example of interacting factors, Norwegians who live near the ocean and consume much vitamin-D-rich seafood have a lower MS risk than those who live inland, even though both groups lack sufficient sunlight to generate vitamin D through much of the year. In another example, Swiss who live at lower altitudes have a greater MS risk than those who live at high altitudes with greater exposure to vitamin-D-producing UVB radiation. People with MS are often vitamin-D deficient. For example, Dr. Jeri Nieves et al. (New York) examined vitamin-D levels in 80 women with MS and determined that levels of the nutrient were often insufficient and associated with reduced bone density. The investigators found that dietary vitamin-D intake was less than the US Recommended Daily Allowance (RDA) in 80% of these women, and 40% reported no sunlight exposure, perhaps to avoid heat-aggravation of MS symptoms. In a later study, these investigators demonstrated that over a two-year period, fractures occurred in 22% of patients with MS compared to only 2% in age- and gender-matched controls. Patients with MS lost bone mass at a 3-7 fold greater rate. Until recently, prevailing thinking was that sunlight exerted a protective influence only early in life. Specifically, if you got a lot of sun before age 15, your MS risk would be much less later in life. This thinking, however, has been challenged by Dr. J.G. McLeod and colleagues (Australia), who examined MS prevalence in migrants to sunny, low-latitude, low-risk Australia from cloudy, high-latitude, high-risk United Kingdom/Ireland. Although theoretically only those who moved before age 15 should acquire the lower Australian MS-risk status, the investigators discovered that MS prevalence in those who migrated before age 15 was not different than those who migrated later in life. In other words, no matter how old you are, you may be less prone to MS after moving to a sunnier environment. In a suggestive pilot study, Dr. P. Goldberg et al (Massachusetts) followed ten people with MS who consumed ~5,000 IU daily for a year of vitamin D from cod liver oil and found that such supplementation greatly reduced MS exacerbations. Once again, these data suggest that protective nutritional influences are not limited to pre-adulthood before you have ever heard of MS but may actually help when you have it. Recently, Harvard University investigators examined data collected from two long-term studies involving 187,000 women. The data indicated that those who consumed the most vitamin D had a substantially lower MS risk than women who consumed the least amount. Many scientists believe that vitamin D mediates its healing influence by interacting with MS’s dysfunctional immune system. Although this is a complex subject beyond this article’s scope, through its hormonal metabolites, vitamin D profoundly influences the expression of 1) a variety of immune cells, which possess gene-modulating, vitamin-D receptors, and 2) key immune-mediating molecules called cytokines. Vitamin D’s immune effects are supported by research using a rodent model of MS called EAE (experimental autoimmune encephalomyelitis). In this model, UV radiation or vitamin-D supplementation greatly inhibited the development, severity, and duration of EAE. In contrast, a vitamin-D deficient diet accelerated disease progression. Evidence indicates that vitamin D prevents cancer, diabetes, arthritis, high-blood pressure, cardiovascular disease, and infections. In other words, it enhances overall wellness. For example, people with SCI are predisposed to diabetes, a disorder characterized by vitamin-D deficiency that experimental evidence suggests reduces insulin secretion. In another example, vitamin-D deficiency is associated with an increased infection risk, again especially germane to infection-prone individuals with SCI, especially in this era of antibiotic-resistant infections. Whether generated through sunlight or consumed through food or supplements, vitamin D exerts many healing benefits relevant to individuals with spinal cord dysfunction. Given exorbitant health-care costs, it’s nice to know that you can accrue these benefits without paying a cent to pharmaceutical companies for costly, perhaps side-effect-laden, drug. Resources: Two excellent overview books are 1) The Healing Sun by Richard Hobday (1999) and 2) The UV Advantage by Michael Holick (2003). Much of the information in this article was obtained from Dr. Holick’s book and his other writings. Adapted from article appearing in June and August 2005 Paraplegia News (For subscriptions, call 602-224-0500) or go to www.pn-magazine.com).